Fastback binding strips are ideal as it takes away the need to punch paper which is required on most other traditional punch & bind methods. 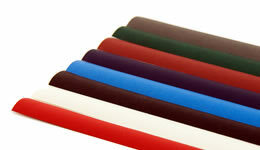 Fastback binding strips are available in a variety of colours and styles to suit your individual requirements. Fastback binding strips also use ‘tailor-fit technology’ – this means that the fastback strip’s spine will fit accurately to your document. The fastback binding strips have the capacity to bind up to 350 sheets and is are available in narrow, medium and wide sizes.